This historic occasion, also attended by members of other religious congregations and many bishops and priests from dioceses throughout Australia and PNG, heralded the beginning of a new era for the Sisters of Mercy. 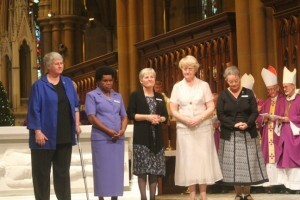 Just six days earlier on December 12, the 180th anniversary of the founding of the Order of Mercy in Ireland by Venerable Catherine McAuley, 14 of the 17 Australian Mercy congregations, along with their sisters from the Autonomous Region of PNG, came together as one new institute for their first chapter. During this inaugural chapter, held at Baulkham Hills in Sydney, 60 representatives of the 930-strong group of sisters elected a new leadership group, comprising Sisters Berneice Loch (Institute Leader), Annette Schneider (Vicar), Theresia Tina (Councillor), Barbara Bolster (Councillor) and Sally Bradley (Councillor). Speaking to those gathered at St Mary’s Cathedral, newly elected leader, Sister Berneice Loch said there was a “deep concern” among sisters gathered at the chapter about the “vast extent of displacement in our world: displacement within individuals who have suffered various forms of trauma; the far more obvious ways of displaced people – economic and political refugees among them; displacement experienced in environmental devastation and change”. Sister Berneice added: “Making a response calls for local action and always will, but to make a difference we need also to work for change at national and international levels. “Sisters of Mercy internationally have a presence in United Nations circles and we hope our renewed capacity will help us all to be a more effective part of those networks,” she said. In his words of welcome at the Eucharist, principal celebrant, Cardinal George Pell acknowledged the contribution of the Sisters of Mercy to many individuals and communities. “It’s wonderful to see so many sisters and friends and I think the number of bishops is indicative of the debt – [for] some of us a lifelong debt – that we owe to the Sisters of Mercy,” he said. For Archbishop Philip Wilson, President of the Australian Catholic Bishops Conference, the Gospel reading of the Annunciation (Luke 1:26-38) was “very appropriate” for the foundation Eucharist of the new Institute. “The Gospel of today reminds us that we live in a Church that began at a moment when Mary, a woman, was able to be open to God and provide a space for Jesus to take flesh within her womb and for the work of God’s redemption and re-creation… to take place. This moment when Mary, the Holy Spirit and Jesus were together, was a moment of re-birth, of re-creation,” he explained in his homily. For many years, but particularly since 2005, the 17 Australian congregations and the Autonomous Region of PNG, who were federated in the Institute of Sisters of Mercy of Australia in 1981, have been searching for the best way to nurture their unity and to strengthen their capacity for engaging in God’s mission of mercy in this twenty-first century. On July 20 this year, the Holy See approved the petition for the new Institute to take effect at the commencement of its first chapter on December 12. On that day, each of the 15 groups ceased to be a separate canonical and legal entity and its sisters became members of the new Institute. The 15 uniting groups, comprising some 930 sisters, are Adelaide, Ballarat East, Bathurst, Cairns, Goulburn, Grafton, Gunnedah, Melbourne, Papua New Guinea, Perth, Rockhampton, Singleton, Townsville, West Perth and Wilcannia-Forbes. While three of the existing 17 congregations – Brisbane, North Sydney and Parramatta – will remain independent, they and the sisters in the Institute are anticipating ways of continuing to collaborate and share their common mercy heritage and their love of their founder Catherine McAuley. High resolution photos taken at Sunday’s foundation Eucharist can be downloaded at this link (All photos courtesy of Beth Doherty).